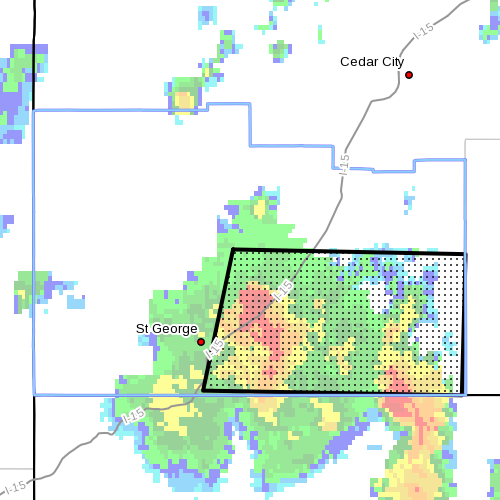 WASHINGTON COUNTY – The National Weather Service in Salt Lake City has issued a Flash Flood Warning for southeastern Washington County in effect until 7:45 p.m.
At 4:36 p.m. the NWS Doppler Radar indicated heavy rain from a thunderstorm over a broad area from St. George east to Zion National Park. Many small washes and slots will be involved with this flood warning. This storm has produced heavy rainfall and flooding in Nevada and Arizona and has now moved into Utah. • Affected areas: Included are Zion National Park, Washington, LaVerkin and Hurricane. Others may be affected as well. • Precautionary and preparedness actions: A flash flood watch means that conditions may develop that lead to flash flooding. Flash flooding is a very dangerous situation. Where are the houses that are flooded?